Congratulations to Luis who won Holiday Gifts from Hasbro. Connect with Hasbro on Twitter. Just in time for the Holidays, SweepstakesLovers and Hasbro are teaming up to give away Holiday Gifts from Hasbro featuring the FurReal Friends Get Up and GoGo My Walkin’ Pup Pet, the Littlest Pet Shop Style Set and the My Little Pony Friendship Rainbow Kingdom Playset ! Readers have until 11:59:59 PM PT on Monday, December 1, 2014 to participate by telling us why they would like to win these Holiday Gifts from Hasbro. Participants may increase their chances of winning by commenting daily and earn a bonus entry by following @HasbroNews on Twitter. On or about December 5, 2014, we will randomly select a winner who will receive the grand prize package, courtesy of Hasbro. Good luck ! The Holiday Gifts From Hasbro Giveaway is open to legal residents of the fifty (50) United States and the District of Columbia who are 18 years of age or older at the time of entry. Void outside the 50 United States and the District of Columbia. Also void where prohibited or restricted by law, rule or regulation. All applicable federal, state and local laws and regulations apply. The Holiday Gifts From Hasbro Giveaway begins at 12:01:00 AM Eastern Time (“ET”) on Saturday, November 1, 2014 and ends at 11:59:59 PM PT on Monday, December 1, 2014. Leave a comment below to tell us “Why would you like to win these Holiday Gifts from Hasbro?”. Follow @HasbroNews on Twitter to receive one (1) bonus entry. Each participant may enter one (1) time per day during the Promotion Period by leaving a comment. Limit of one (1) bonus entry per participant. One (1) Grand Prize : Winner will receive Holiday Gifts from Hasbro. Approximate Retail Value of the grand prize is $139.97. Meet the leader of the FURREAL FRIENDS pack, GET UP & GOGO, MY WALKING PUP pet, a girl’s best pet friend! The GET UP & GOGO, MY WALKING PUP pet brings lifelike puppy play to children as she sits and speaks on command, and even comes when you call her, wagging her tail as she walks. This pup even reacts when other FURREAL FRIENDS pets are near, such as POM POM, MY BABY PANDA pet (sold separately), and will bark to say hello when she hears her! For a whole new way to play with GET UP & GO GO, MY WALKING PUP pet, kids can download the free FURREAL FRIENDS app, available in the App Store and Google Play. Using the FURREAL FRIENDS app, children can virtually care for their GET UP & GOGO, MY WALKING PUP pet. The GET UP & GOGO, MY WALKING PUP pet will even respond to all the on screen action with movement and happy barks! Within the app, kids can also play fun games, and even meet other virtual FURREAL FRIENDS pets. The free FURREAL FRIENDS app will be available for download at the App Store and Google Play. The FURREAL FRIENDS app is not required for GET UP & GOGO, MY WALKING PUP pet play. Requires 4 “C” batteries, not included. Available at most major toy retailers nationwide and on HasbroToyShop.com. One (1) LITTLEST PET SHOP Style Set. HASBRO/Ages 6 years & up/Approx. Retail Price: $39.99/Available: Fall 2014. Pulled right from the “Littlest Pet Shop” animated series, the LITTLEST PET SHOP style set is the hub of all activity for BLYTHE and her pet friends. Fans can create and decorate this stackable and customizable set with 135 pieces, including wall panels, accessories, reversible scene backdrop, stickers and Deco Bits -unique, small accessories that plug into LITTLEST PET SHOP pets and style sets for a little added glamour. Then fans can style their own pet shop, with colorful curtains, fabric rug, bookshelf, and other decorative pieces. Style set comes with three exclusive LITTLEST PET SHOP pets, including MINKA MARK monkey, SUNIL NEVLA mongoose, and KITTERY BANTER cat. The LITTLEST PET SHOP style set can be stacked with other LITTLEST PET SHOP style sets from Downtown City for additional world play. Each style set sold separately. Available at most major toy retailers nationwide and on HasbroToyShop.com. One (1) MY LITTLE PONY FRIENDSHIP RAINBOW KINGDOM Playset. HASBRO/Ages 3 years & up/Approx. Retail Price: $39.99/Available: Fall 2014. 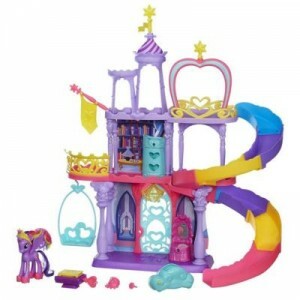 MY LITTLE PONY fans can discover the newest royal empire inside the FRIENDSHIP RAINBOW KINGDOM castle playset, a grand three level palace fit for a pony princess! Use the friendship keys to unlock a number of magical accessories within the kingdom, including a wardrobe, vanity, book, and treasure chest. Pony friends can travel the kingdom in style on the rolling cloud car, taking a ride down a fun swirly slide. Stops along the way include a lookout tower, golden balcony, swing, and more. Includes PRINCESS TWILIGHT SPARKLE figure, key, cloud car, and themed accessories. Available at most major toy retailers nationwide and on HasbroToyShop.com. We will pick 1 lucky person and announce the winner here on or around Monday, December 8, 2014. This giveaway is sponsored by Hasbro. Connect with Hasbro on Twitter. Disclosure: Hasbro is providing the prizes to the winners. This year like most of my past years’ Christmas years, I have been unable to finance gifts for my family, but I would like very much to be able to give the lil ones a gift given by me this year. Why? Because when we are young and inexperienced we do not have knowledge of where the presents come from only that we like to get them. I remember so clearly the years we didn’t get gifts from our parents. My father was a steel worker and his job was a union worker job, therefore we were given each year a ticket to the Christmas Union worker party where they would distribute the employees’ families a gift for each child which had been paid for by their union dues. Each of us got to pick a toy from a bunch on display and only one per child. It would lasts us for the rest of our lives. We would be so content with our gift and had punch and Christmas carols and it is how we spent each Christmas for many years. I would give anything to re-live those times. Nowadays, kids get more expensive gifts but do not know how to appreciate them like we did due to our unfortunate circumstances but yet they are worth much more in memories than the present ones. I hope to those who read this, comprehend the meaning and are able to relay this message to their children. I would love to win these toys for my daughters, because Hasbro toys are the best! Thank you for the wonderful giveaway. These toys would make my two kids smile on Christmas and I’d love to see that. Thank you. Hasbro toys have been in our house for years! When our kids were growing up & now we buy them for the grandchildren – we have 15 of them! The GET UP & GOGO, MY WALKING PUP is already on a couple of their Christmas gifts. We have some My Little Pony & My Littlest Pet Shop toys from when our kids were smaller. They have been a favorite for years – THANKS for all the smiles and hours of fun through the generations in our homes!! My cousins would love this. I would love to win for my granddaughter. Her mom is single & works so hard. I help where I can. This would be the ultimate Christmas surprise for all of us. Prize pack is the greatest! I would like to give these to my family. Santa’s list has just been submitted……win win! As a dog lover, that has to be my favorite toy! I volunteer with helping thousands of kids throughout the year. The games will be put to good use. These are definitely dream gifts. This would be just awesome to win. My daughter would just adore this and it would help out a lot this year. Happy holidays to all.